This week we started noticing that Anson's speech was slowing and he couldn't hear us when we talked to him in our natural voices. If we spoke loudly he could hear, but otherwise, he tuned us completely out. Which, you know, could be just a normal five-year-old thing to do. But this morning Chup took him to the doctor to get things straight and there was fluid in his ears, granting him his first ear infection in years. Poor boy. On the bright side, Chup also took him in for a haircut, asking the stylist to give his son his very own dream do from the mid-80's. 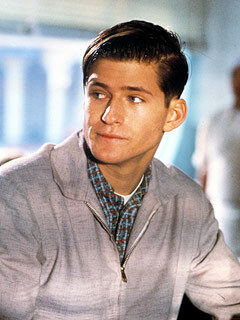 I think it looks a bit Crispin Glover-ish. And given Anson's unique moodiness and coolish ways, it fits him. Please note: Chup has always shared the responsibilities of our children as such: anything that we have to take our children to outside of the house usually falls on his plate, inside the house, the responsibilities are mostly mine. See how I don't have to get dressed mostly ever? Ever has dreams of dressing everyone in the family with Wizard of Oz costumes. She's Dorothy with her checkered blue-and-white pinafore and some red plastic shoes (the girl can rummage through the dress-up closet like no other three-year-old). Erin was blessed with role of Glinda and was awarded a one-of-a-kind Styrofoam star wand made from Daddy's workshop. (Alternatively, Erin has been asked to be Toto, and she's wonderfully happy for either position.) Anson is supposed to be The Tin Man, but he's not keen on playing along--you could say his heart's not in it. I suspect if we produced an ax he'd be quickly on board. Daddy uses his great acting skills to mimic, almost exactly, The Cowardly Lion. As for me, I'm "Mrs. Gultch" who, as we all know, turns into the Wicked Witch, but Ever is fascinated by Dorothy's mean neighbor and the terrible witch being the same woman, so we call her Mrs. Gultch at Ever's request. Anyway, I do enjoy walking around eeeeking and making my fingers crooked and squinting in despite. Erin talks in full sentences and she just turned two. "Mom, I need you. Open the door." It's a little spooky, I have to say. Also, I put myself in time out frequently, thus the need for my two-year-old to quickly pick-up the phrase, "Open the door, MOM!" Necessity really is the best teacher. But will Sad Drums make a good scarecrow? Because we seem to have an opening.